A mural which Stein obtained in Mazar-tagh(8) depicts a herd of horses with their saddles removed being led by a groom. Such images show the way in which horses were highly valued as livestock. Being on a horse naturally raises one’s level of vision, and in order to maintain a large herd of horses, one would need to obtain a reasonable stretch of land. That is to say, a person would need wealth to own a large herd of horses. In this way, since ancient times, horses adorned with beautiful accessories and large herds of horses were considered symbols of power. In the Yan State cemetery of the Western Zhou period at Liulihe (Liulihe ��璃河 Xizhou 西周 Yanguo-mudi 燕国墓地) in Beijing, 121 tombs and 21 horse-and-chariot pits have been found. In these tombs, remains of fourteen horses and five chariots were found in the M1100 horse-and-chariot pit, which is thought to be attached to the great tomb, M1046. In addition, in the early Sychian era Arjan royal tomb site-- located in Russia’s Tuva Republic to the north of Mongolia-- there is a site where horses were sacrificially interred along with humans in burial . All the horses discovered in the grave were older than twelve years in age, and it is thought that the horses were buried in such arrangement whereby six were placed in the middle around which a total of 161 horses grouped according to their color were buried in groups of fifteen or thirty. Furthermore, uncovered relics such as a coin minted in Kushan Kingdom, which flourished in the. 1st--3rd century in northwest India, show a figure of a king on horseback. 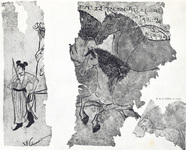 A mural in the Mogao Caves also shows a figure of a nobleman riding an extravagantly decorated horse (The Expedition of Zhang Yichao ���x潮�y�出行��(9)). Such findings are all proof of how horses functioned to accentuate the position and power of their owners. Throughout human history, horses have not only been associated with power but have also been taken up as sacred image. 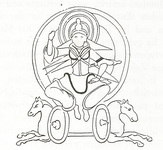 4th century ceiling painting above the eastern Great Buddha of Bamiyan, Afghanistan, for example, depicts white horses drawing the chariot of Surya, the sun god. Inceiling painting(10) at the Kumtura Thousand Buddha Caves in Xinjiang, China, we also find a similar image of the sun god(10) which has horses drawing the sun god’s chariot. In a Sui era (隋) piece of silk fabric with pearl medallion patterns(11) found by Stein at the burial ground site of Astāna, we see a pair of winged horses facing one another under the influence of Sasanian art. Similar pearl medallion decorations have been found in Afrasiyab, in Samarkand, as well―a site also surveyed by Stein. The horse came to be deified as humans lived together and came to depend on the animals. They were in this way incorporated them into the worlds of gods or imaginatively displayed with wings in art, etc. These examples show us the way in which horses were understood by the peoples who lived in close proximity and depended so heavily on these animals for their livelihood. They were clearly set apart from that of livestock used for meat.